GO50: The Finish Line for 50K in 50 Days | JustRunLah! 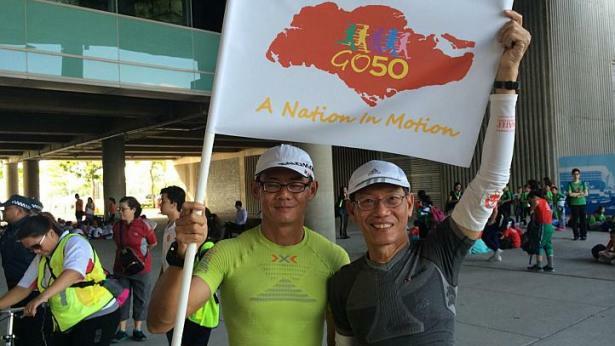 Today marks the last 50km run of the Go50 Run project initiated by 2 admirable ultra runners, Mediacorp editor, Lim Nghee Huat, 61 and PE teacher Yong Yuen Cheng, 43 who have been running 50km daily for 50 consecutive days to commemorate Singapore’s 50th birthday and spark off the sporting spirit for the SEA Games opening tonight. 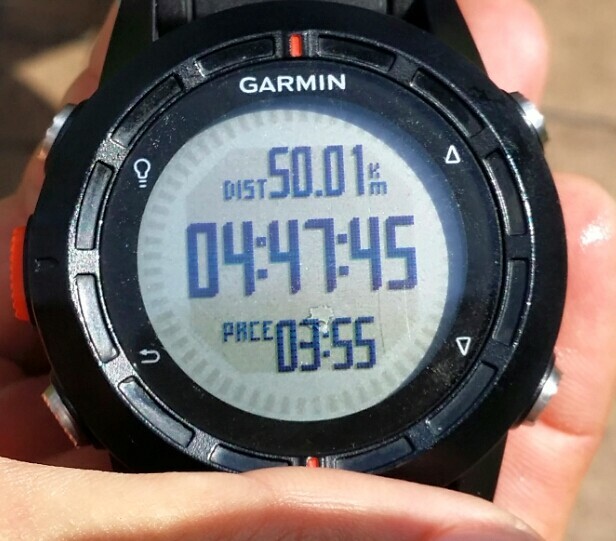 On April 16, the duo started their first 50km feat as part of their Go50 Run project where values of resilience, determination and perseverance had to be embodied to complete the challenge. The fastest record clocked by the duo was a spectacular timing of 4 h 47 min on day 47, while the most excruciating run took them 9h 51 min to complete on day 24. The scorching heat and merciless sun were the main factors that affected their running reserves and timings during this period of the year where heat in Singapore is at its peak. In addition to unpredictable outdoor conditions, Yong had to endure running with his Achilles injury and Lim also sustained a kneecap injury while running along the footpath on day 3. It was a physical feat but the runners also battled mental exhaustion. Besides putting negative thoughts aside, Yong enjoyed the different scenery and weather conditions they encountered every day, which was fresh and gave them something to look forward each day. 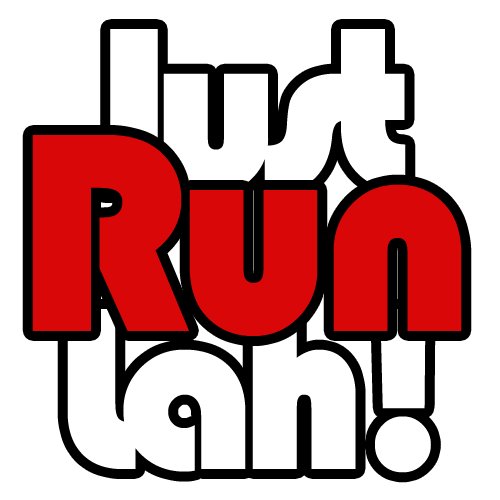 Yong and Lim managed to run through scenic places, such as MacRitchie Reservoir Park, Labrador Park, Fort Canning Park and East Coast Park. The unbeatable duo had a common desire to make a significant contribution to Singapore, as well as to pay tribute to the nation’s founding father, the late Mr Lee Kuan Yew. A collaboration between the Institute of Technical Education (ITE) and Heartware Network, Go50 is a youth engagement project to commemorate Singapore’s 50 years of independence and celebration of the extraordinary human spirit. The project spans across 50 days of Yong and Lim’s running journey, one character trait or contribution of our founding father, the late Mr Lee Kuan Yew, is selected as the theme for the day. The final theme of the project for Day 50 is Gratitude – In 2014, the Singapore Government introduced the Pioneer Generation Package to honour and thank the pioneers for their hard work and dedication in making Singapore what it is today. According to GOSG50, about 450,000 Singaporeans will benefit from the Pioneer Generation Package. An entourage of runners, pacers and volunteers is with them every step of the way. Supporters for the duo came from all walks of life, including students and working professionals who ran together with them for part of or the whole of their 50km journey. An elderly lady also walked with them on her 82nd birthday and provided home brewed health supplements to boost their energy and relief the heat. 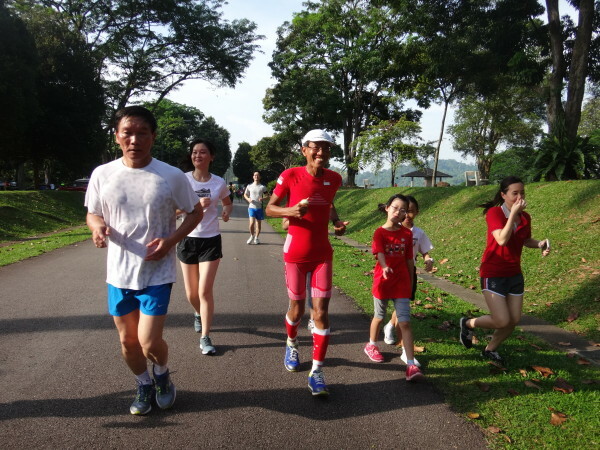 Another notable group of supporters came from the visually challenged runners of a community sports club, RunningHour, who showed their support by running alongside Yong and Lim for part of their course. Mr Lim’s wife has also put her business on hold, waking up every morning to prepare energy drinks, fruits and energy gels for all the runners. Yong and Lim took special care in their diet by including food rich in energy-giving carbohydrates, proteins, amino acids, vitamins and minerals so as to have a well-balanced diet to support their mental and physical energy reserves. The humble duo hopes to inspire Singaporeans to “make sports a part of [their] lifestyle” and proved that “ordinary guy like [us] can do things that are extraordinary – like running 50km daily in 50 days”.